Robertson's interest in clay came from her father's job as a bricklayer. She learned basic techniques in high school and honed her craft in college at University of Northern Iowa. She taught high school art for five years. After pregnancy made throwing on the wheel impossible, Robertson learned to prefer hand-built pottery. 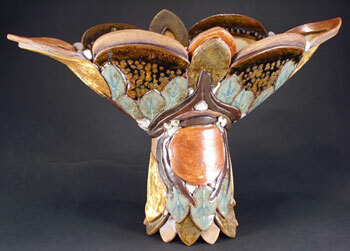 Since 1980, Robertson has sold her pottery, with her husband Richard Robertson, at over 30 art fairs. Of her work, Liz writes, "I would describe my work as decorative/functional. I maintain the vessel form but focus on elaborate highly colorful surface patterns derived by using many glazes that are applied onto pieced together slabs and coils. It is not unlike mosaic but more fluid since the clay is still wet when assembled. The surface patterns are carefully designed to compliment the pottery form as well as exhibit good design compositions. I use both abstract and figurative subject matter derived form nature. . .
We live in an overly processed world of shortcuts. Society has a disconnection with its understanding of the processes of how a thing is made and from what. The hand maker has the advantage of experiencing a problem-solving process from beginning to end. This freedom also allows for the creative process to flow uninterrupted to an intimately personal conclusion that is esthetically pleasing. This human connection is a major selling point for handmade work. My customers meet me, can ask questions and take home something unique and lasting."